Above is a scary picture for those who are afraid of spiders. 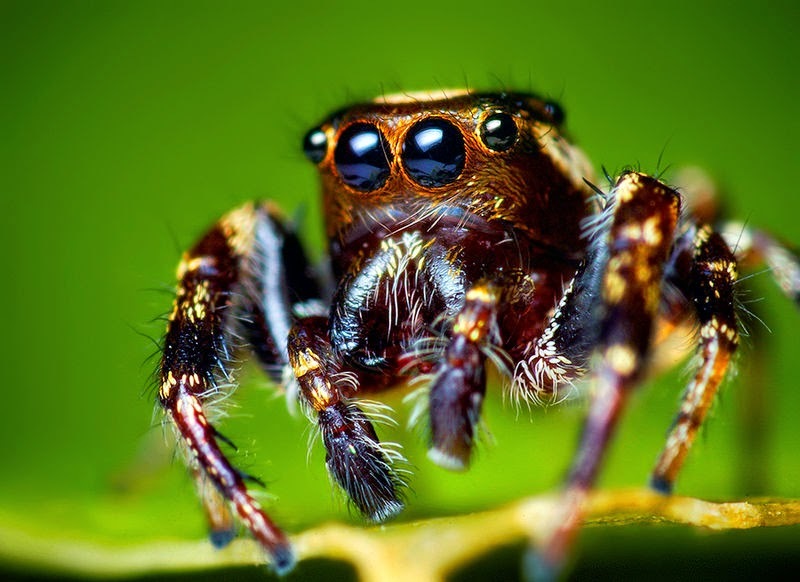 It is a photo of a jumping spider named Eris Militaris. This picture was chosen because of the importance of dwarf planet Eris in the chart of two terrorists as I will show you. Eris is sesquisquare midpoint Sun/Moon in the chart of one and elevated in the chart of the second one. Eris (wrath, chaos and strife) is the goal and the motivation of terrorism. It is the day of the big manifestation against terrorism in Paris. Here are the AA rated charts (source Astrodatabank) with transits and progression of the late Saïd and Chérif Kouachi, the brothers who murdered the staff of CharlieHebdo (see earlier post) for you to study. Charts, as you know, can't be read without considering the genes, gender, situation, conditions and culture, age or period in history. Charts are just astrological pictures of the sky for a certain moment. At that certain moment cats, dogs, birds, companies and human beings were born, people died and married or gave birth and there were accidents or happy moments for hundreds of thousands of people. The chart shows important items and issues. Astrologers see the picture of the sky as a reflection of a certain moment and they believe that the moment of birth (seeing the light) is the most important moment for a person. The picture of the sky shows the nature of the person. The charts of the brothers must also be seen in the light of their position in society and their background. That is even more important here, because their charts highlight the importance of genes and background (Ceres). And the importance (for them) of disharmony, discord and fights (Eris). d. The tightest aspect in his chart is Jupiter square Neptune. Jupiter-Neptune is the combination of the believing audience, the fans and followers and devotion. That is why Jupiter-Neptune is related to the movies, but also to beliefs and religion. A square is for a difficulty, a battle. This tight square makes being a follower or believer an important issue in his life. e. The Sun-Uranus minor aspect refers to being an outsider, alienation, independence or rebellion. 2. the progressed Descendant inconjunct Venus. There is also an Eris-Node opposition. That is it. 1. Sun semi square Mars and conjunct Uranus. The Sun-Mars-Uranus combination is frequent in charts of terrorists, but doesn't necessarily mean that you have to be a terrorist, of cours. 2. Uranus rising before the Sun made it important to be controversial and 'different'. 3. Sun/Moon midpoint sesquisquare Eris motivated for disharmony and is motivated by it. The Leo Ascendant is for drawing attention. That completes the picture. As a member of a group (of terrorists) you could see the chart as that of a man eager to act, motivated and at the time perhaps driven by an ideal. Charts don't judge or explain. Charts show us how a person's astrological situation is and need to be interpreted. We must see them in the light of the background and circumstances and weigh all factors. Actors and sports men were born on their days of birth. There are many ways to deal with anger and aggression or energy. The fact that it didn't take much to turn these brothers with these charts into killing machines - prepared to die in the name of their faith - is very scary. There is an important astrological signal in their charts that might be the key to their acts. Eris. Eris is important in their charts. The position of this symbol tells us that chaos, strife and disharmony was their goal (elevated Eris) and motivated them (Sun/Moon Eris). Eris is the symbol of jealousy. In the myth, she was the one not invited for the party (she always quarreled, that's why), seeking revenge by causing chaos and this ended in the Trojan war (with the famous Trojan horse, by the way). One named Paris was involved. Strife whose wrath is relentless, she is the sister and companion of murderous Ares, she who is only a little thing at the first, but thereafter grows until she strides on the earth with her head striking heaven. She then hurled down bitterness equally between both sides as she walked through the onslaught making men's pain heavier. She also has a son whom she named Strife. http://www.astromarkt.net/jupiter-in-aspect-with-neptune.html On aspect and midpoint combinations of Jupiter and Neptune, the symbol of the devoted audience. http://astropost.blogspot.nl/search/label/Eris Eris is the symbol of discord. There are a number of examples on this site.